A complex set of disturbances brought snow and showers to the Northeast on Tuesday, as a dynamic system, including a tornado with winds reaching 97 mph, touched down in northeast Ohio. Gusts of 50 mph blasted much of the Midwest. 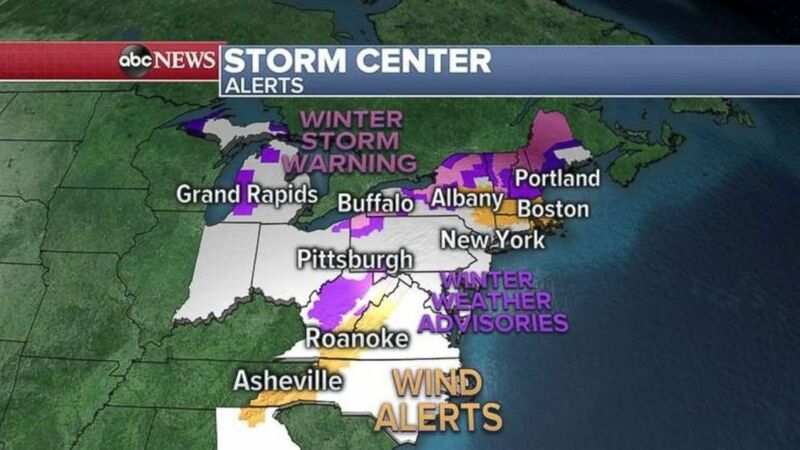 Winter storm warnings and advisories or wind alerts are blanketing more than a dozen states this morning. Several rounds of snow showers are continuing to move northeast today, with the snow squalls coming off the Great Lakes potentially quite intense. Brief whiteout conditions will be possible, including on major interstates such as I-80 and I-90. Wind gusts from the squalls locally could be more than 40 mph, including up through parts of New England. 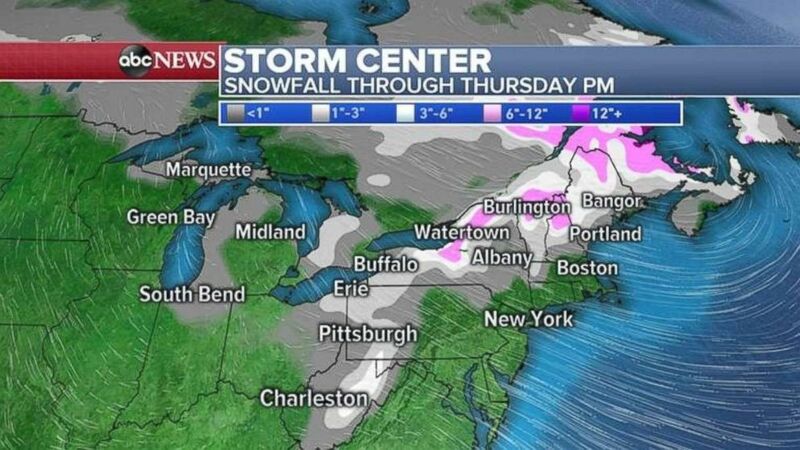 Much of the Northeast will see snowfall through Thursday evening. More than 6 inches of snow is possible along the Great Lakes and into parts of northern New England. Parts of New York closer to the Great Lakes could see as much as a foot. 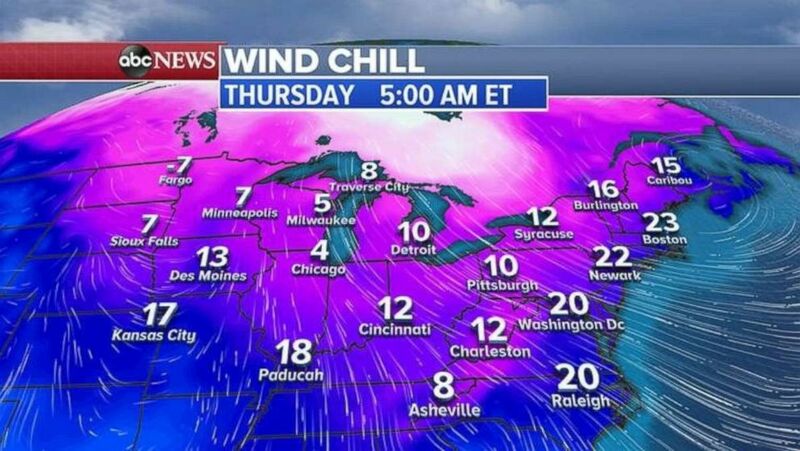 Wind chills on Thursday throughout much of the U.S. will be extremely cold. Wind chills on Thursday will be in the single digits in the upper Midwest. A potential new storm may be forming over the Midwest. A meaningful but not blockbuster winter storm could be heading east this weekend. 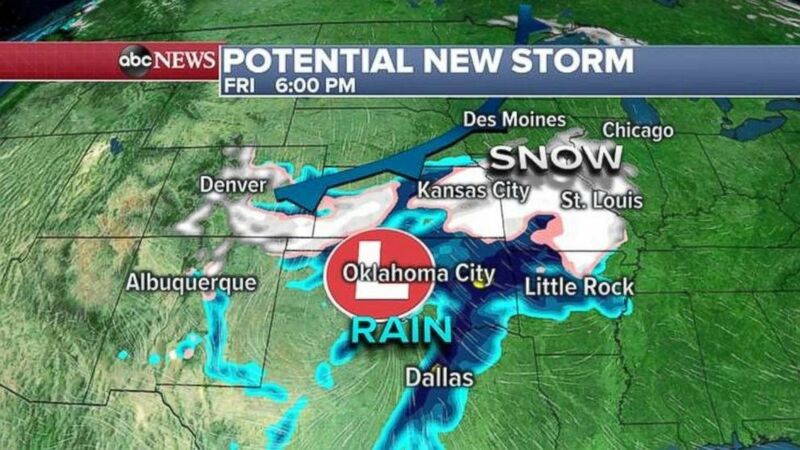 By Friday night and into Saturday, it appears two systems will become one organized system, bringing rain to the southern Plains and some snow to the Midwest and parts of the Mississippi River Valley. This same storm will slide off fairly quickly to the Ohio and Missouri River valleys on Saturday. A cold front approaching from the northwest will try to interact with this system, and, at the very least, the combination of systems should help draw more snow northward into the I-70 corridor. The storm then will shift toward the East Coast over the weekend. It doesn’t appear at this time that the two systems will completely phase together and create a blockbuster storm. The storm may intensify somewhat off the coast on Sunday. Although the likelihood of snowfall in parts of the Midwest and East Coast is increasing, it remains unclear the potential magnitude of this weather event. As of this morning, two reliable weather models are indicating there’s not enough support in forecasting a major storm this weekend. Another storm is hitting the West Coast today. 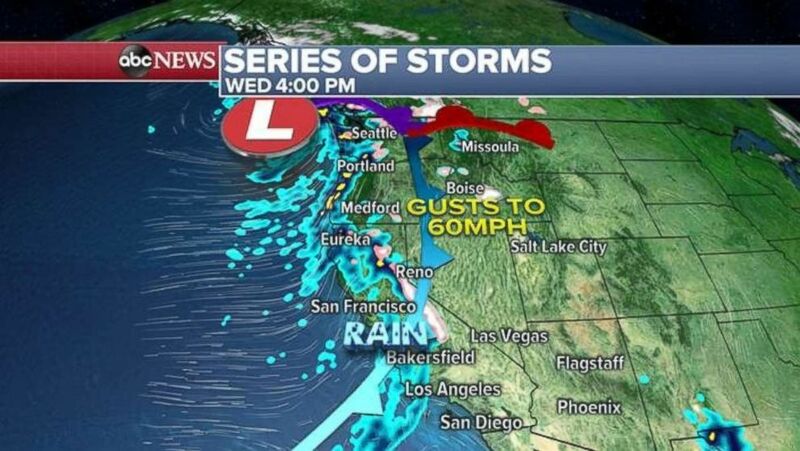 The latest Pacific storm is delivering rain, gusty winds and snow to the West Coast. Booneville, California, just north of San Francisco, already has seen 3 inches this morning. A wind gust of almost 80 mph was reported in Lagunitas Forest. This series of storms has over the last few days dumped at least 39 inches of snow at Donner Peak, at the Sugar Bowl Ski Resort. Local rainfalls in Northern California and southern Oregon could be heavy at times today, with raining moving into Los Angeles and potentially leading to localized flash flooding.